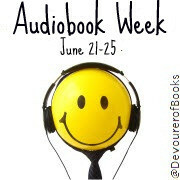 For the first four days of Audiobook Week, I posted on the daily topic. Today, I am going take a different path. I hope you take the time to visit all the participating blogs; you can find them by checking out Jen's blog and clicking on the Mr. Linkys. Today, I'm talking about picking your first audiobook, audiobook genres, and some of my favorite audiobooks. Do you want an audiobook just so you can see if the medium is for you? Do you want to jump in the deep end? Testing the waters: If your goal is the see if audiobooks work for you, then I suggest going with a classic or an old favorite. Lots of people have talked about how much they loved revisiting the Harry Potter books through audio. Or try something older: Pride & Prejudice, The Secret Garden, or Jane Eyre, for example. The trick here is that you already know the story, so if your mind starts to wander a bit, it doesn't really matter much. Diving right in: If you just want to give audiobooks a shot and you're not in the mood for a reread, then pick the next book in a series you are reading or a title from an author you like. That way, it's the medium that's new, not the entire experience. For the truly adventurous, I suggest picking a book you just can't wait to read and start listening. You may be surprised by how quickly you are drawn into the story. One more tip: don't just sit in a chair in listen, get up and do something--that's one of the big advantages of auodiobooks. Is there a genre that doesn't work in audio? Well, I haven't tried poetry, but I bet I wouldn't like it. Short stories and essays are also a problem for me on audio. Why? Because when I read a collection of work, I don' t necessarily read every piece and I don't always read them order. Audio would take away my ability to pick and choose. I've heard some people say that nonfiction doesn't work on audio, but I've had great success with history and biography. It is true that I often pair my nonfiction audiobook with a print copy (usually from the library) so that I can see the maps, photos, genealogies, and other visuals. In terms of fiction, I don't think there is a genre I wouldn't try. I'm more apt to turn down an audio because I don't like the narrator, because the book is abridged (should be against the law), or because it is advertised as a dramatization than because of its genre. Do I have favorite audiobook genres? I love listening to mysteries and historical fiction on audio. I haven't checked my stats, but I would bet they are my two most-listened-to genres. Well, I've also listened to quite a bit of biography. And fantasy. And young adult. Okay, so maybe I don't pick my audiobooks by genre. Here, in alphabetical order are some of my favorite audiobooks from the last few years, divided into nonfiction, adult fiction, and young adult. There are many, many more audios that I have loved, but I wouldn't hesitate to recommend any of the titles I've mentioned. Such a wonderful post, and very informative! Another great audio to start out with is To Kill a Mockingbird. It is brilliant with Sissy Spacek. Another good point to make is that listening is a practiced skill, and just because you wander all over the place in your first audio, it doesn't mean that you will always have that problem. Long live the audio books! Middlesex is on my favorites list as well; great list C.
I have Stiff in my audible.com library. Downloaded it a couple years ago for book club and never got to it in time... thanks for reminding me! I totally forgot Wicked Lovely. *head desk* How stupid of me! That is one of the best ever. This is such a wonderful post. So much great advice, so many great books! Thank you for taking the time to write it all out for us, veterans and newbies alike. Excuse me, I now have to go hunt down Stiff. I loved it when I read it years ago and never even considered it was an audiobook! I love Mary Roach's books! Hmmm... I've had some good luck with nonfiction audiobooks, but most of them were memoirs, though Columbine by Dave Cullen was fabulous as an audiobook. PS, I love your header picture. I have a picture just like it from my trip to Bruges. Excellent advice for sure! A couple series I really enjoy are Craig Johnson's Walt Longmire narrated by one of my favorite narrators, George Guidall. I also love Louise Penny's Three Pines series narrated by Ralph Cosham. And I completely agree that there should be a law about abridged audiobooks. Yuk! I forgot about Thirteen Reasons Why - it was fantastic on audio! Fantastic post! I'll be pointing audiobook newbies to this for a long, long time, I think. t post, I especially enjoy seeing your faves. I've got Wicked Lovely on my stack, but I am going to listen to it instead. This week my almost non-existant audio TLT (to listen to) list hard grown. This is good avice. I have never tried an audio book. Somehow I don't think it is for me, but your suggestion that you can do something else at the same time convinced me to try. If there is little time to do all the things we want to do, audio books might be the answer. I think I'll give it a go. I downloaded Pretty Little Liars yesterday to listen to while I was at the pool with my boys, but the narrator's voice gave me a headache. Not recommended. I'm going to try 13 Reasons Why next - it's a book I've always wanted to read! Someone who has not had success with audiobooks might take your advice to start with a classic or a book they've already enjoyed. The rhythm of listening does take a bit of getting used to, as you point out. I just found your blog and am so glad I did! I LOVE listening to audio books and have had at least one going at all times for the last 16 years. That is the only way I can "read" classics, which tend to be too long-winded for me to sit and read. I've listened to all Dickens books, Jane Austen, the Bronte Sisters, etc. My favorite genre though are mysteries. My first audio book was the first in the Amelia Peabody series by Elizabeth Peters - Crocodile on the Sandbank. I'm just now listening to her latest one. And my all-time-favorite narrator is Barbara Rosenblat - she is a master at voices and accents. Very glad to find this list. I'm finally taking my passion for listening to podcasts and transforming that into listening to books. Finished Lethem's Ecstasy of Influence and Hitchens' Arguably.